On vessels which are used for pleasure fishing, such as those which boat rentals on Westfjord charter for such use, do not have much room for nautical charts. Plotters are used instead; they contain charts of those areas where fishing is practised and the harbours where to set sail from. These charts are usually not very precise but they are very handy. It is good to know the base on which this navigation technique is based on. Therefore we are going to talk a bit about nautical charts; what they are based on, their types and use. The nautical charts we use are based on a technique which the Belgian and theologian Mercator (March 5, 1512 in Rupelmode – December 2, 1592 in Duisburg) invented sometime during the 16th century. This type of charts is called projection maps. Printed nautical charts are very simplified replicas of the surface of the earth. 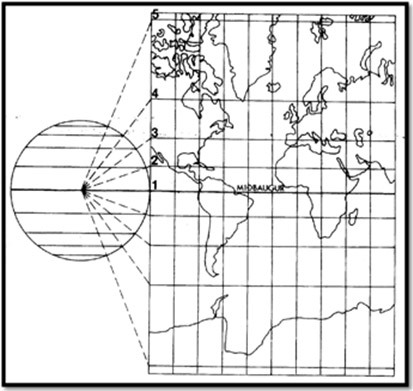 As we know the earth is globular, but in the nautical charts that we use the lines of latitude and longitudes have been straightened and are not circular. Nautical charts are drawn in certain scales which specify the proportion between the size of the map and the actual size of the area of the earth which the chart covers. Usually three types of nautical charts are used, such as sailing chart which have small scales, for instance 1:3000.000 and cover large areas of the sea; and special charts which cover smaller areas and are often in larger scales, for example 1:100.000, and are the main maps used for navigation and when sailing into harbours. When sailed near shore and into harbours it is best to use nautical charts with large scales. This image explains the idea behind projection maps. Image of the surface of the earth is projected on a plane by placing a light source near its centre. As can be seen on the image, the lines on latitude have now become stretched on the plane. 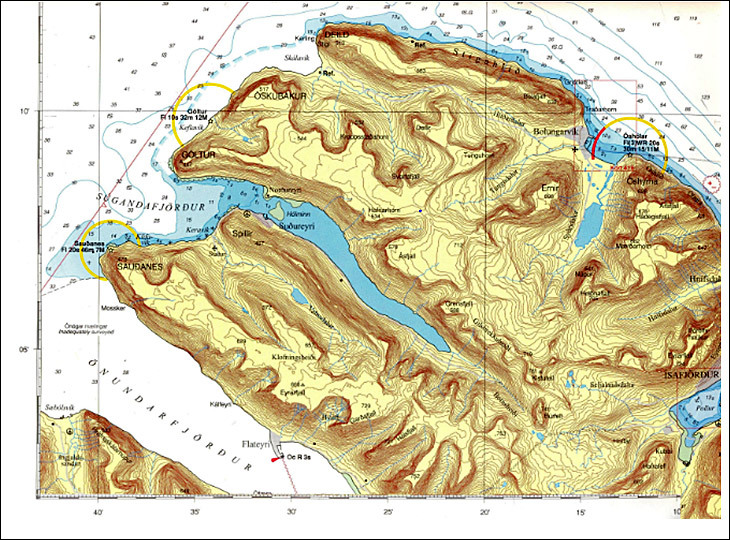 This is a nautical chart of the north side of the Westfjords. The scale on the outside of the chart shows the lines of latitude and longitude. The lines of latitude are on the vertical scale. The lines of longitude are on the horizontal scale. The distance is read from the latitude scale which is vertical. Nautical charts are important and a good aid in navigations. There you can find information about natural circumstances, such as shallows, sediment, islands, reefs and sunken rocks; you can also find information about help- and information devices, such as buoys, lighthouses and radar detectors; in addition, you can also find information about ships’ routeing, such as traffic separation schemes. It is important to choose a nautical chart which is suitable to the navigation ahead; therefore we should choose a chart with a large scale since they can give us the most accurate information.